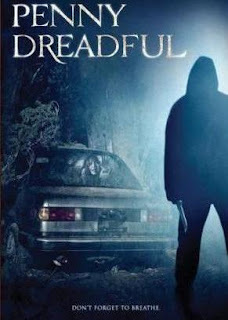 Tag line: "Don't forget to breathe..."
Directed by Richard Brandes, Penny Dreadful is a taut thriller that manages to keep you on the edge of your seat for the better part of an hour. Unfortunately, the film runs for an hour and a half. As a young girl, Penny (Rachel Miner) was involved in a tragic auto accident, one that claimed the lives of both her parents, and since that time, she's not been able to so much as ride in a car without becoming violently ill. To overcome her fear, she agrees to accompany her therapist, Orianna (Mimi Rogers), on a road trip that will take her back to the scene of the tragedy. But when the two offer a ride to a stranger (Liz Davies) they meet on a dark road, their trip takes a sudden and terrifying turn towards danger, leading Penny to confront her phobia in ways she never dreamed possible. Rachel Miner does a fine job as Penny, elevating the film's tension to what at times is an almost unbearable level. Shortly after picking up the stranger, both Penny and Orianna begin to suspect that something is very wrong with their new passenger. Their worst fears are realized when the stranger, who seems unable to talk above a whisper, produces a skewer of raw meat, offering Penny and Orianna a bite before tearing into it. Though Penny tries to maintain a casual demeanor through it all, attempting to make small-talk with the stranger, we can tell the poor girl is absolutely terrified of this new riding companion; she grasps at the blanket in her lap more tightly with each passing moment, and her eyes betray the many thoughts that are racing through her head. Throughout the film, her character will be subjected to many frightening ordeals, and Miner hits the perfect note with her performance in each and every one of them, never once taking things to a level beyond believability, even when hysterics set in. Where the film derails is in the final act, the psychological cat-and-mouse game begins to lose some of its steam, and several 'extra' characters, who had been introduced earlier, contribute nothing at all to the story. While there are still strengths to be found in these later scenes (Miner remains effective, as does Rogers in a more limited capacity), the filmmakers could have easily trimmed 10-15 minutes without losing anything of substance. That aside, I would still recommend Penny Dreadful; it's an exceptional film for two-thirds of its running time, and the weaknesses in the back end do not detract from the strengths at the beginning. DrShock, excellent news on the new horror podcast. I am extremely happy for you to be continuing on and with a podcast I know will be regular. I would of commented sooner but I seen you getting overrun with comments so I figured I would give you a break. I have been reading your blog on a semi regular basis when I get time. Good luck and I know this new podcast will top the other one. Although you were torn on this Shock you haven't let me down yet with your recommendations. I will get it. @Chaz: Great to hear from you! We're all real excited about HORROR JUNGLE, and I thank you for the kind words. As for commenting, no worries! I'd rather be bombarded than get none at all! Thanks again, and thanks for being a regular on the blog as well. Your contributions are always appreciated. Have a great day! @Miguel: It's awesome that you checked out Kaycee's podcast! I'll be sure to let him know the next time we speak. As for spilling the beans...oh well! We're not exactly dealing in military secrets, so we can let it slide! Thanks again for stopping by, and please stop back to let us know what you think of Horror Jungle. Thanks again, everyone. Your comments are greatly appreciated. just heard the latest pod, incredible news and cast devoted to horror jungle. i am there sir!!!!!!!!! Thanks for the comment, and we're as thrilled as you with the new format. Thanks for hanging in there during the recent chaos, and thanks also for listening! Have a great day. @J: Thanks for stopping by! No, not today. I'm sticking with the same schedule I kept during Planet Macabre: horror movies on Sunday, Tuesday and Thursday. So hang in there...a new one's coming tomorrow! As for your wait for the 1st episode, it's getting closer. We recorded the show 2 days ago, and it will release on time Tuesday morning. Thanks again for stopping by, and for listening. DrShock I tried to post earlier but it got hung, don't know if it was a fluke or the site was having problems. You're such a nice gentlemen and I really value your podcasting and blog. Even though I don't always have time to respond I do read through each horror movie review and comment. @Chaz: Sorry it gave you some problems. I love Blogger, but there are times when it's a little dodgey. I thank you for hanging in there, and re-posting your comment. I also thank you for the kind words. I do understand that time doesn't always allow for you to post a comment, so please know that I appreciate you taking the time to check out the blog on a regular basis.